The WAXIE Diamond Guard System is an exceptional floor care system that is perfect for education, hospitality, healthcare, government, industrial/manufacturing, commercial real estate and foodservice facilities. It includes a series of urethane finishes and sealers for LVT (luxury vinyl tile), VCT (vinyl composition tile), terrazzo, linoleum, ceramic, natural stone, concrete, recycled rubber, and safety, embossed and smooth rubber floors. With minimal application, drying, and curing times and maximum durability, these finishes and sealers will enhance and protect your facility flooring investment. An investment in your facility flooring will keep your business on solid ground! WAXIE Diamond Guard Urethane Remover | 322200 For urethane and acrylic finish removal on all floors. WAXIE Annihilator Prep and Strip Concentrate | 320122 For acrylic finish removal on all floors. 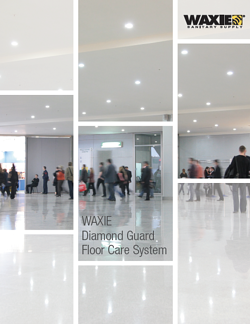 WAXIE Diamond Guard S Catalyzed Sealer | 934210 For luxury vinyl (LVT), VCT and terrazzo. WAXIE Diamond Guard CF Catalyzed Sealer | 934212 For use on ceramic tile, quarry tile, concrete and natural stone. WAXIE Diamond Guard CS Sealer | 930003 For luxury vinyl (LVT), VCT and terrazzo. WAXIE Diamond Guard RF Urethane Floor Finish | 930001 For VCT, linoleum, Marmoleum, terrazzo and terrazzo. WAXIE Ceramic Guard Floor Finish | 933002 For ceramic, natural stone and concrete. WAXIE Diamond Guard VF Urethane Floor Finish | 930004 For luxury vinyl (LVT), linoleum, recycled rubber and safety, embossed, and smooth rubber. WAXIE Diamond Guard TZ Catalyzed Mop-on Urethane Floor Finish | 933101 For VCT and terrazzo. WAXIE Diamond Klenz Daily Neutral Cleaner | 320121 For all floors. 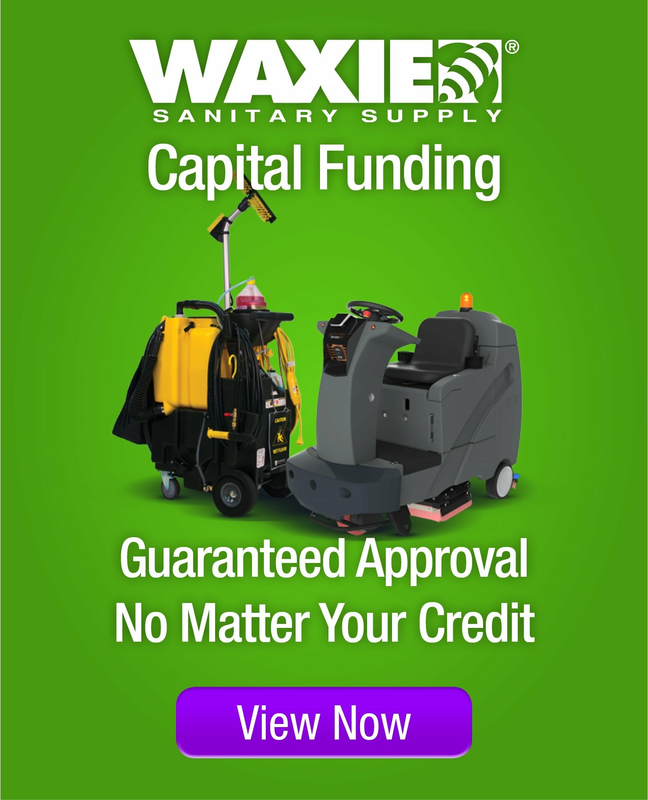 WAXIE has solutions for all of your floor care needs. How can our products work for you? As you prepare to refinish your floors consider the pros and cons of the process. Does the finish need to dry quickly, or can the area be closed off for dry time? Who is applying the finish? Do they have the training needed? Determining the parameters up front can help you save time, money and your sanity. Below are the steps involved in making, and keeping, your floors in tip top shape. Let's get started. Step 1: Identify your floor surface. What are you working with? The first step in floor finishing is to identify the type of flooring in your facility. Has it been finished before? How will the introduction of the WAXIE Diamond Guard system affect it? Step 2: Prepare your floor surface. Time to strip! Stripping all of the old finish off of your floor is essential to creating a shiny new surface. Removing the old sealer and finish reveals the base level of flooring in its porous and unprotected state. Once all of the coatings have been removed the floor is in a state where a new sealer and finish can bond with the base. Step 3: Seal: to preserve and protect. Sealing a floor provides the base and the barrier needed to protect floors from dirt and enhance material longevity. Sealers are made of smaller polymer molecules than finishes, so the molecules fill the porous material more easily and the base builds faster than that of finish. These polymer molecules create a strong film that can withstand daily and interim maintenance, including scrubbing and recoating of finish. Step 4: Apply finish. Let it shine! Floor finish is like the icing on a cake – it makes everything better! Floor finishes have smoother polymer molecules than sealers, so light is reflected back to the eye as opposed to being deflected. The molecular difference in finishes also makes them easier to remove than sealers, so they can be maintained and enhanced on a regular basis. Step 5: Clean and maintain. Daily cleanings keep dirt and debris from getting ground into a floor, where it can abrade the finish and deteriorate the coatings. Daily cleanings also extend the life of the sealers and finishes which limits the amount of time and work intensive strip and recoat procedures.